Offer Gift Card purchase to your customers. Providing Gift cards widens your window of sales. 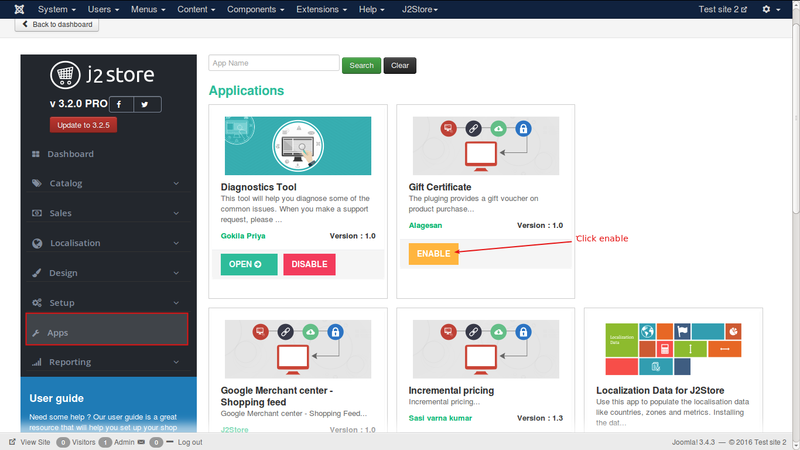 With this plugin, Store Owners will be able to create and sell Gift cards. A gift card or cash card is automatically generated and sent as email. 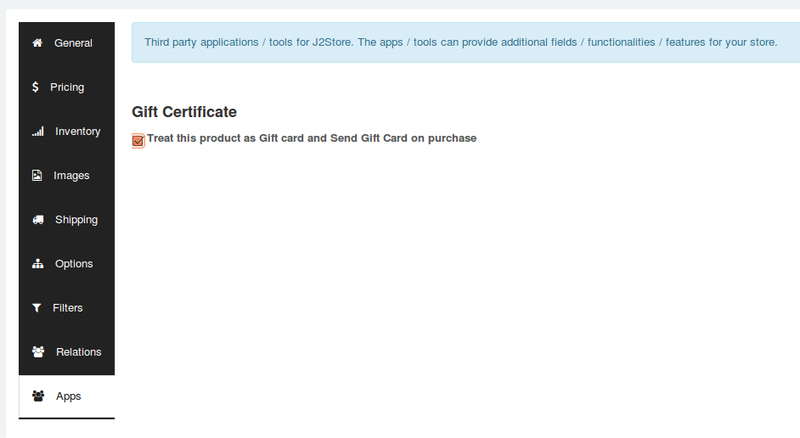 NOTE: The gift card app works only with the PRO version of J2Store since the vouchers are a PRO feature. 3. Click Enable in the Gift certificate app. Setting this option to yes will allow you to have a validity date for the Gift Card. Enter the validity time of gift card in terms of days. Enter the validity time of gift card in terms of months. Enter the validity time of gift card in terms of years. For PDF generation and attachment this app uses a third party pdf library known as DOM pdf. This setting will show if Dompdf library is installed or not. If it shows "Installed" then everything is alright. If no, then please install the dom pdf library and check the plugin again. If wants to allow customers to purchase multiple gift certificates, set this option to YES. Setting YES will allow customers to due multiple gift cards with different receivers. Filter the order statuses for which a gift voucher should be selected. PDF will be attached and sent only when the status of the order is among the chosen values here. Recommended setting: Confirmed status. When a payment is successful the order is changed to Confirmed status, so choosing confirmed status here will make sure that the voucher is generated only if the payment is successful. 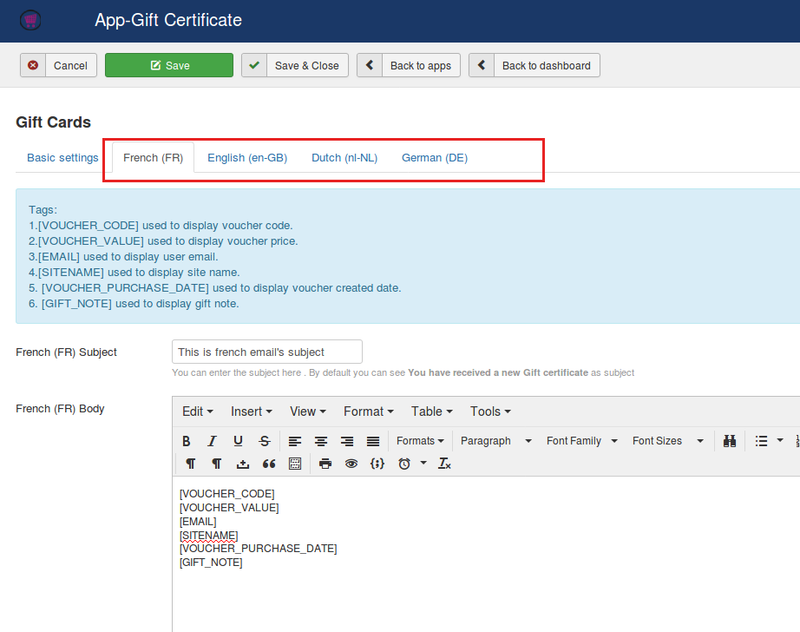 A prefix can be added to the voucher code or gift card to make it more relevant. A voucher code or gift card might be a random code of numbers and alphabets that is generated by the system and cannot be predicted manually. Would you like to round the voucher value ? Then, enter the value by which the voucher value should be rounded.For example, if point is in decimal(0.60), it will change the decimal to whole number. Can the gift voucher / code can be applied to the shipping cost as well? Should voucher value include the tax as well? This helps for those merchants who have gift voucher prices including tax. If set to NO, it would create a gift voucher with a value minus tax. NOTE: This might cause confusion to your customers. They would see the price of the voucher as 500. If you send a voucher with a value minus tax (example: 500 - 10% tax), he might come back to you and question. Allows the customer to have multiple voucher based on the product quantity. Send a copy of the gift voucher to the store administrators? As a store admin, if you would like to receive a copy of gift certificate email, set this option to YES. If you have enabled above option, you will have to give the administrator email here. You could also enter multiple emails separated with comma (,). Set the date format for the Expire/purchase date. If set to YES it generates a PDF of the below voucher Body and sends an email to the customer. Name of the file that is attached with the email. Choose YES to this option, if you would like to add background image to the PDF voucher. 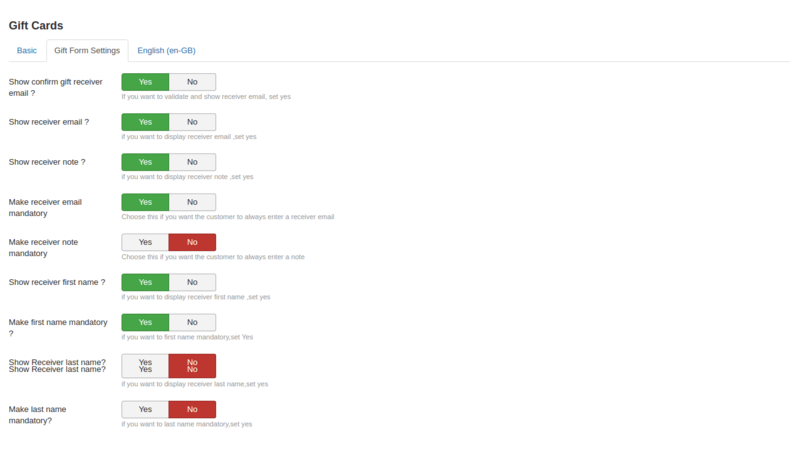 If you set YES to above parameter, choose the background image here. Make sure the image you have uploaded is optimized and small. Add CSS class name. If not sure about it, please leave it blank. If you would like to validate the receiver email address, set this option to YES to show confirm email address field. If you would like to display the receiver email address, set this option to YES to show receiver email address field. If you would like to display a receiver note, set this option to YES to show a receiver note. If you want your customers to enter the receiver email always, set this option to YES to make this field as required field. Setting this option to YES will make the receiver note field as required field. Show receiver first name ? If you want to display the receiver first name ,set this option to yes. Make first name mandatory ? Setting this option to YES will make the first name field as required field. If you want to display the receiver last name ,set this option to yes. Setting this option to YES will make the last name field as required field. How to add subject and body of the email ? The subject and body of the email could be added by navigating to the tab next to basic settings tab. 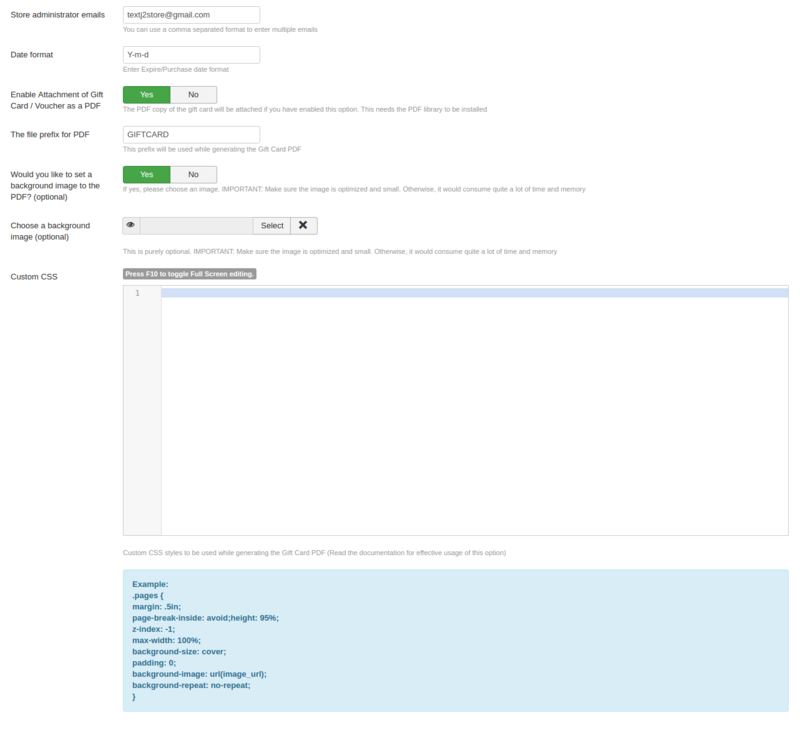 If you are having multiple languages in your site, you could also add different content for different languages. [VOUCHER_CODE] - used to display voucher code. [VOUCHER_VALUE] - used to display voucher price. [EMAIL] - used to display user email. [SITENAME] - used to display site name. [VOUCHER_PURCHASE_DATE] - used to display voucher created date. [GIFT_NOTE] - used to display gift note. [GIFT_RECEIVER_FIRST_NAME] used to display gift receiver first name. [GIFT_RECEIVER_LAST_NAME] used to display gift receiver last name. [GIFT_RECEIVER_FULL_NAME] used to display gift receiver full name. [EXPIRATION_DATE] used to display expiration date. [GIFT_CONTENT] used to display gift content from article. [PRODUCT_NAME] used to display product title. [VOUCHER_CODES] used to display list of voucher code(Only Quantity based multiple voucher), can use invoice template also. [VOUCHER_QUANTITY] used to display number of voucher code available for multiple voucher(Only Quantity based multiple voucher). [GIFT_PRODUCT_QUANTITY] used to display product quantity of single voucher. If you wish to see a sample of the mail and how it looks then click on the SEND TEST EMAIL BUTTON after completion of body and subject set up. How to sell gift card or cash card in my online shop ? Most of the online shops / ecommerce stores have the option to buy a Gift Card. It is one of the opputunities for store owners to widen their chance of sales. Create a cash card product and start selling Create a J2Store product with product type as "Simple product". Configure all basic options such as price and navigate to the apps tab. You could find an option that says "Treat this product as Gift card and Send a Gift Card on purchase"Tick the checkbox as shown in below screenshot. How the customer can use this Gift card ? A Customer purchases this gift card. A voucher is created for this order placed with the value of the product. For example if the gift card product price is $100, then a voucher of value $100 is generated and an email is sent to the customer. That email subject and body could be configured in above section. The Store admin should Enable Gift Vouchers under J2Store Setup > Configurations > Discount tab > Enable Gift Vouchers, set this to Yes. Save the configurations. Store starts accepting vouchers in the cart section. The customer can enter the voucher code in the cart section to redeem the gift card value.